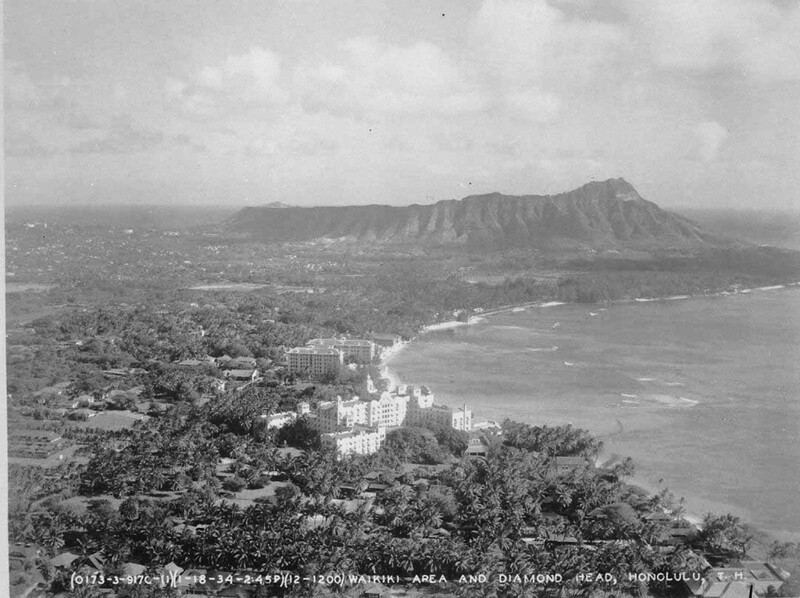 Iconic Diamond Head crater rises in the background while scenic (and small for most of us youngsters) Waikiki beach and the up-and-coming town of Honolulu come to life in the foreground in this aerial shot of Honolulu in 1934. Without Diamond Head, few would recognize this land and shoreline as the spot that is now home to highways, high rises, and hundreds of thousands of people. In the 1930’s, Waikiki and Honolulu were just gaining a reputation as a destination. Few flights or cruises found their way to Hawaii back then and those that did hauled tourists who were on the leading edge of the future.